Send Gifts To Romania online gift store offers a variety of apples that you can buy and send as gifts to Romania. 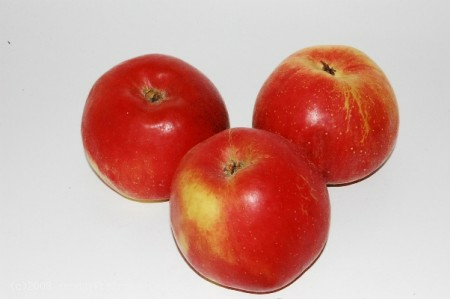 Rich in vitamin C and antioxidants, apples are a healthy treat that wil be savoured by the receiver! Send Gifts to Romania info: Did you know that apples appear in many religious traditions as a mystical or forbidden fruit? Though the forbidden fruit is not idenified in the Book of Genesys, popular Christian tradition says that a serpent tempted Adam and Eve to eat an apple from the forbidden tree in Eden. As a result, the apple became a symbol of knowledge, temptation and immortality. The greek mythology sees the apple as "the apple of discord" Heracles, the Greek hero was required to pick the golden apples off the tree of life from the garden of the Hesperides. The Greek Godess, Eris became disgruntled after being excluded from the wedding of Peleus and she tossed a golden aple "for the most beautiful one" The apple was claimed by Hera, Athena and Aphrodite. Paris was appoited to select the most beutiful one of the three. Tempted by Aphrodite with the charms of Helen, Paris awarded the apple to Aphrodite. Also, in the Norse mythology, the goddess Iounn was named the keeper of golden apples that kept Esir young. Abducted by Pjazi, ahe was not able to keep the apples safe so this lead to Esir begining to age. Also the Celtic mythology includes a story obout Conle who receives an apple htat feeds him for one year. Info offered by our online gift store Send Gifts To Romania, your best source of fresh fruit baskets!